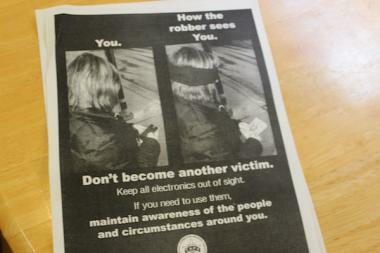 The Town Hall Police District is aggressively trying to educate people about how to prevent robberies with flyers like this. LAKEVIEW — Many of the robbers contributing to the jump in crime this year are traveling in packs, said Lakeview's police commander. Robberies have more than tripled from the same period last year in Town Hall District, from 24 last year to 84 this year. Most of the crimes happen at night, with Belmont Avenue around the Red Line as "the nucleus" of the crime, said Town Hall Police Cmdr. Elias Voulgaris. Groups of two to three people have been a major source of the robberies, Voulgaris said at a Neighborhood Safety and Sanitation Meeting Monday at Ann Sather Restaurant, 909 W. Belmont Ave.
"It used to be individuals, but quite a few packs have been stealing," Voulgaris said. Voulgaris did not know why more robberies were happening in packs but said they were not gang-related crimes. The groups of offenders are usually young, and there were juveniles involved with some of the robberies, Voulgaris said. No specific numbers were available on the percentage of robberies committed by a group of people, said Sgt. Jason Clark. Most of the victims have been unaware of their surroundings, often wearing their headphones at night, checking their phones or too intoxicated to notice suspicious people, police have said. The top stolen item is iPhones, Voulgaris said. Voulgaris, who's only been in the position since August, was reviewed earlier this year and said he was under fire for January's jump in robberies. The month had nearly five times more robberies than the same period last year, from 13 to 62, accounting for redistricting. February had a 50 percent decrease in robberies from January but still had more than twice as many robberies as the same period last year. "Robberies is my main concern," he said. Cops made 18 arrests in January out of 62 robberies, Voulgaris said. They made 12 arrests out of 27 robberies in February, Voulgaris said. The district has been tackling robberies with its special entertainment night detail, made up of afternoon cops that volunteer to work the midnight shift, and aggressively educationing people to be more aware of their surroundings. Flyers with safety tips have been posted in bathrooms at bars and local businesses and passed out on the street. Tips include limiting alcoholic drinks, staying off cell phones and not wearing headphones. Cops have more control over the robbery situation now with these efforts, Voulgaris said. "I can't stress enough: Prevention," Voulgaris said.